Kinetic energy penetrators are currently relied upon as a way to defeat enemy armor. Historically these penetrators have been composed of unanium or tungsten based alloys due to their high densities. In addition to density, the deformation behavior of the alloy determines it's performance. A penetrator whose tip mushrooms or fractures on impact is less effective than a penetrator that retains it's shape or has a tip that self sharpens. Although the densities of uranium and tungsten are similar, uranium alloys have generally exhibited deformation on impact that has resulted in better penetrator performance. The drawback with uranium alloys, however, is toxicity and cost. In this Phase I SBIR program, tungsten alloys will be processed in a variety of novel ways to improve their performance as penetrators. The effect of rhenium additions will also be examined. X-ray diffraction, high rate compression testing, and optical microscopy will be used to assess the results. Tungsten alloy is ideally suited for a wide range of ammunitions, from small to large calibre. The combination of our innovation, process mastery and strict inspection policy brings to our products a quality level that meets the most severe demands. 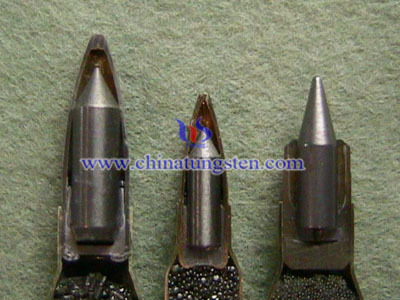 Tungsten alloy is suitable material for tungsten alloy small arms ammunition. Chinatungsten Online can provide the product. If you have questions, please feel free to email us:sales@chinatungsten.com or call: 86 592 5129696.